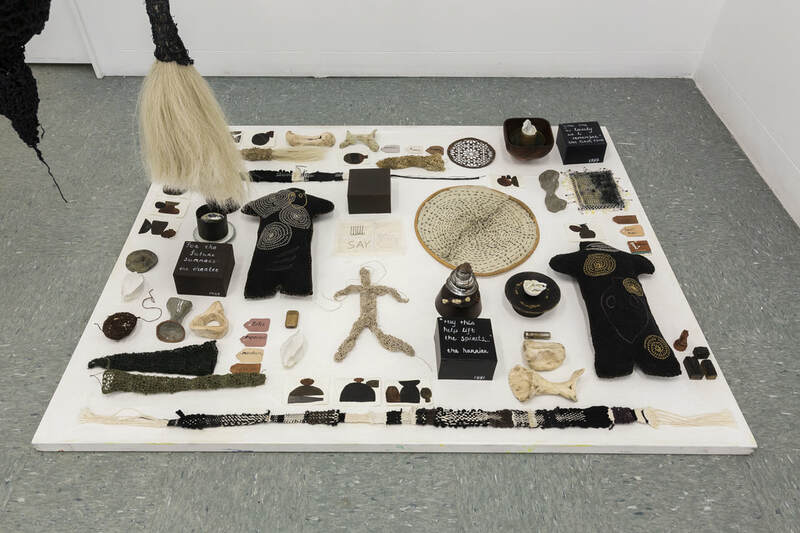 Top: Deborah Burdett, Reliquary, (detail), 2018, tableau of found and made objects, ink, ceramic, cane hoop, fabric, weaving, yarns and metal. Bottom: Untitled (soft sculpture on musical notes), 2018, cloth, threading found musical instrument pieces. Top: Annelies Jahn, float (detail), 2018, found cream chargers. Bottom: 10:57am, 01.09.15 #3, and #2 2018, found broken solar cell glass in acrylic boxes. Constructing art from what’s held within or around. Not purchased or shiny but decrepit, remembered, derelict. Found objects saved from destruction and given new lives, new uses. Blemished with the qualities of traditional Japanese wabi-sabi, Deborah Burdett mends, stitches, glues, repairs and repurposes the discarded and hand-made. Her work combines textiles, cloth, ceramics, cottons, hair, fragments, bones and wire into patinas, surfaces, texture and scapes. Deborah utilises various forms of slow stitching, knitting, crochet and weaving, looking to ancient global techniques to inform her work and using inks, charcoals, acrylics and watercolours. These hand-felt materials formulate her ongoing research and practice of ‘CRAFT AS COMFORT’ containing text and references literal, obscure and quoted. Deborah has BA in Visual Arts from Monash University and and MFA from the National Arts School. She also has a Graduate Diploma in Design (SCA) and a Masters of Social Science from RMIT University. Her 40 year corporate career has seen her involved in retail, design, architecture, planning and more recently the arts and health sector. She has worked in Melbourne, London, Sydney and New York. Her 10 years spent dryland farming in Victoria’s Mallee region during the 1990’s drought has influenced her aesthetics, her love of the found, her value for the volunteering sector, and her interest in collaboration of the arts in mental and physical wellbeing. She was selected for the Narrative Knot at the Manly Regional Gallery in 2012, was shown in the Melbourne International Festival 2002 – Bute Utes and has been in a number of group shows over the last few years. A curiosity in the nature of perception, place, the temporary and ephemeral motivate Annelies Jahn’s art practice. Her observations of objects, phenomena and actions, take the form of collecting, mapping and measure. Annelies’ practice is an investigation of the relationship between things and the space they reside in, through her own experience and perception. In this desire to understand our relationship to place – or habitation, she seeks out fundamental questions of the human condition. Intuitive processes result in a play between object, place and space. The activities of proposal, making, documentation and remnant become the work. 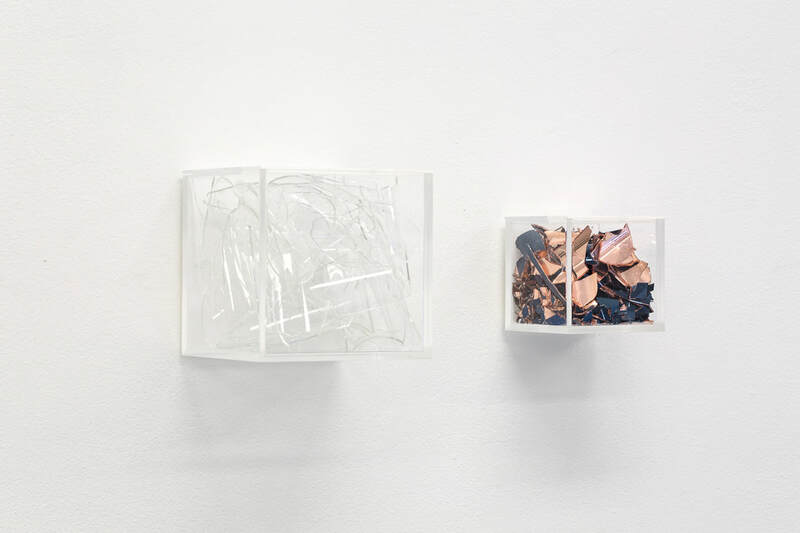 With a minimalist sensibility Annelies utilises industrial and discarded materials such as acrylic, metal, styrofoam, mylar and cardboard. Her work takes form as installation, intervention, assemblage, drawing, painting, photography and video. Jahn’s work has been exhibited in Australia and overseas. She has had solo shows and short residencies in Sydney. Her work is held in the National Art School Archive and in private collections. Annelies has had an extensive professional career in graphic design and publishing, working in Sydney and London. She holds a Master of Fine Arts from The National Art School, Darlinghurst. She is a sessional and public programs teacher at the National Art School. Annelies is a director at STACKS Projects Inc., having previously acted as a director at ES74 Gallery. Annelies was awarded in the .M Contemporary, YAI 2015. She was the recipient of Coutts Family Award for Excellence in Drawing, FONAS Drawing Award and has been a finalist in the John Olsen Drawing Prize.